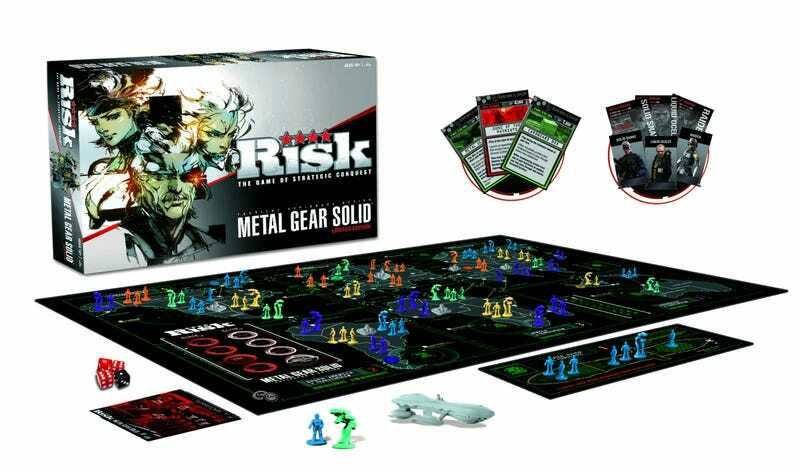 First unveiled at San Diego Comic-Con earlier this year, here's our first look at the retail version of the game that blends the strategy of Risk with the game design of Metal Gear Solid... No, it doesn't come with cut-scenes. The game goes on pre-sale on Oct. 3, for $49.95. The game takes place in the near future after war has become privatized and instigated by "third-parties," according to the press release. In the game, players command one of the five Private Military Companies (PMCs) who have risen to power and face off against an army of foes. To win, you must launch daring attacks, defend yourself on all fronts and boldly sweep across vast lands. The game board has six zones and 42 territories. Among the game contents are: 275 custom plastic playing pieces representing five private military companies, neutral armies and cities, a custom Outer Haven battleship and game board, 8 Boss Cards, 40 Drebin's Cards and 42 Territory Cards and 8 Rewards that can be earned. The packaging for Metal Gear Solid Risk features custom artwork by Yoji Shinkawa, Art Director of the Metal Gear Solid franchise. Let's have a look why don't we. Remember to click on the bottom corner of each image to view it full-sized.